On the basis of the intensity, Burns can be classified into three categories. The first category, known as first degree Burns consists of those Burns that are less serious in nature, for instance, sunburns. In this category of Burns, only the outer layer of the skin, that is, the epidermis is damaged. They remain less serious as long as considerable areas of face, feet, groin, hands, buttocks or a major joint are not involved. The second category consists of those Burns in which in addition to the outer layer, the next layer of the skin, that is, dermis is also damaged. It is more severe than the first category. Last but definitely not the least is the third category which consists of the most severe type of burns. In this, the damage permeates through all the layers of the skin. Tissues, muscles and even bones may be affected by this type of a Burn. 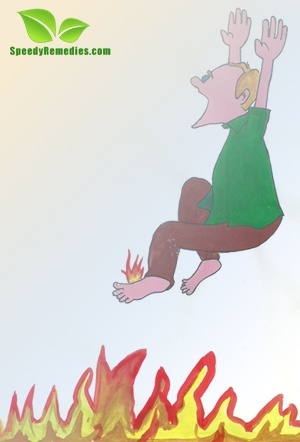 Burns cause damage to the skin which in turn increases the risk of developing infections. The location of the Burn is an important aspect and the treatment should be carried out keeping the site of Burn in mind. The most common causes of Burns are heat, radiation, electricity and chemicals. Touching hot objects, flames, or on overexposure to the sun may also result in Burns. The first degree Burns produce minor symptoms such as redness of the skin, minor pain and swelling. In the second degree, the pain increases along with the development of blisters. The third degree burns appear white in color, leathery in texture and are liable to be less painful. It has been observed that in the absence of proper remedial measures, the Burns become more severe. The first degree Burn may graduate to the next degree, that is, second degree and the second degree Burn may worsen and evolve into a third degree Burn. So, it is recommended to treat it as soon as possible. Natural home remedies for Burns are completely safe and valuable in this regard. Before moving to the remdies, one should be familiar with of some precautions related to Burns. One should avoid putting ice directly on the Burn as it can cause more damage due to sudden temperature change. Also, applying ointments on the burnt area prevents the proper healing of the skin. In case of minor Burns, cold water can be used instead of ice to reduce the temperature of the Burn. In addition to these, the following natural home remedies for Burns are beneficial in providing relief and healing the burnt skin. • Applying a paste of henna leaves and water is a valuable natural remedy to ease the pain and temperature. • Put some sugar on betel leaves and crush both the ingredients together. Applying this mixture helps to reduce the temperature of the burnt area. • Applying pure honey on the burn area is a source of great relief and even aids in the healing process. • Soaking the affected area in whole milk for about 15 minutes serves as one of the most effective home remedies for Burns. • Applying lavender oil on the Burns for some time and then removing it is an excellent natural remedy. • Putting pomegranate peels on the burnt area acts as an effective cure in easing the pain and healing the wound. • Putting mustard on the Burnt wound for one hour is a tried and tested home remedy to cure Burns. • Applying egg white on the Burnt area may seem odd but at the same time it is a very popular remedy used in the treatment of Burns. • Applying Aloe Vera gel extracted from its leaves is one of the simplest natural home remedies for Burns. • Poultice prepared from fenugreek or curry leaves is helpful in the treatment. • Applying a mixture of crushed banyan leaves in ghee (preferably prepared from cow’s milk) is useful in healing Burns. • Because of their therapeutic properties, onion and potato slices are efficient home remedies for Burns. Just put an onion or potato slice on the wound for some time and then remove it to reduce the pain and facilitate the healing process. • Applying two teaspoons of yogurt on the burnt area for about fifteen minutes is an effective natural home remedy used in the treatment of Burns. • Applying banana pulp on the affected area helps cure the Burns and prevents the formation of blisters. • Prepare a paste of limestone in one cup of yogurt. Apply this paste on the burnt area helps to prevent the formation of blisters because of the Burns. Papaya is considered as a good remedy in the treatment of Burns. Thus, it would be wise to include papaya in the diet to cure Burns as soon as possible. The diet should also include citrus fruits as they are rich sources of vitamin C which aids in the healing process. Fruits, vegetables, cereals and nuts rich in vitamin A, vitamin B complex, vitamin E, zinc and copper are also highly beneficial in this regard. Fresh juices like that of apple, pears, grapes, pineapple and even tomato are highly recommended in the treatment of Burns.